Traveled by explorers and settlers, El Camino Real gets new attention at state parks. 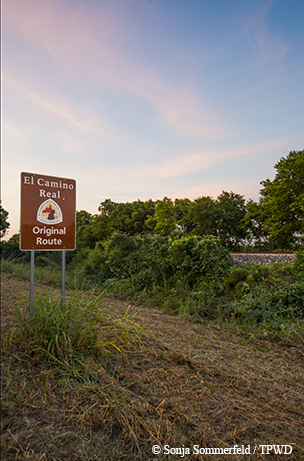 El Camino Real is Texas’ own Route 66; it’s the mother highway that carried travelers from Mexico to Louisiana long before concrete strips or railroad ties crisscrossed the state. As with that famed route, some communities along the way morphed into population centers we inhabit today, filled with varying cultures from those who traversed this camino, or road. Some communities just vanished, abandoned when railroads chose different courses. Spanish explorer Alonso de León entered Texas in 1689 on what would later become known as El Camino Real de los Tejas. A suspected French interloper, Robert de la Salle, had landed on the north Gulf Coast near Matagorda Bay with the intent of establishing settlements, and the Spanish crown in Mexico thought they’d better send de León to remind la Salle that the land belonged to them. It’s thought that the route followed Native American trails. El Camino Real de los Tejas would eventually expand and become a path of overland travel that runs through today’s Laredo, San Antonio and Austin, then northeast to Nacogdoches. Mission Rosario State Historic Site. A camino real, or royal road, connected two Spanish capitals. El Camino Real de los Tejas runs from the interior of Mexico at Santiago de la Monclova (colonial capital of Coahuila province) to Los Adaes, capital of the Spanish province of Texas from 1729 to 1773 (near Robeline, Louisiana, 30 miles from the Sabine River and the Texas border), connecting the missions and presidios in between. Despite the “royal” connotation, everyone — affiliated or unaffiliated with the Spanish crown — traveled El Camino Real. In later years, traffic flowed the other direction as the road, also known as the Old San Antonio Road, became a key route of immigration into Texas. Texas heroes like Davy Crockett, James Bowie and Sam Houston used the road to come to Texas. Stephen F. Austin traveled El Camino Real to sign the first colony land grant. Frontiersmen, pioneers, settlers and fugitive slaves — all with different motives, yet taking the same path — traversed El Camino Real de los Tejas. 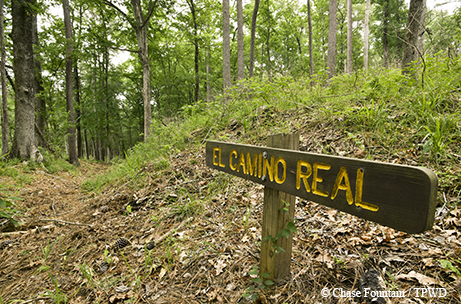 Traces of El Camino Real are visible at Mission Tejas State Park in East Texas. Today, it remains the oldest marked trail in the United States — older than the Oregon Trail. Many highways still follow the original route of El Camino Real, though remnants of the original road have faded with time. Some of the only physical remains of the road remaining today are elongated U-shaped depressions called swales created by the tracks of many carts and wagons and their draft animals. The oldest road retains its ability to lure us to travel, camp and seek adventure in Texas state parks that now lie along its path, and the historic road adds a fascinating historical component to consider when visiting those parks. State parks along El Camino Real de los Tejas National Historic Trail received $1.5 million in federal funding and $3.5 million in state funds in 2016 to construct interpretive projects and conduct long-deferred renovation; those projects should be completed this year. Let’s visit the three Texas state parks and historic sites along El Camino Real de los Tejas to immerse ourselves in the world of Spanish explorers and the cultural influences that followed. On his fourth expedition into Texas, de León led a group of 114 men to establish a mission in East Texas. De León founded the first mission in the Spanish state of Texas, Mission San Francisco de los Tejas, in 1690 near a Caddo tribal village. In October 1693, disease and failing crops caused those friars, frustrated by failing conditions and inhospitable lands, to bury the mission bell and cannon, and burn the mission to the ground. Two decades would pass before Spanish settlement efforts resumed in East Texas. The mission was founded on San Pedro Creek, which still flows on the north end of present-day Mission Tejas State Park. The Civilian Conservation Corps claimed the land for reforestation in the 1930s and built a commemorative log chapel during the Texas centennial in 1936. 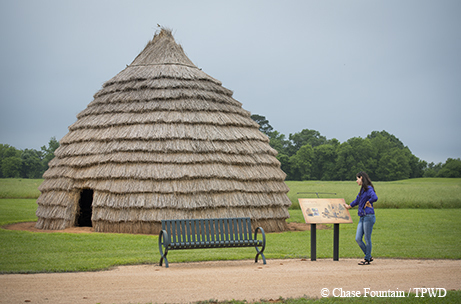 Spanish explorers blazed the trail as they established the first mission in Texas among the Caddo people, who lived in thatched huts, as seen at Caddo Mounds State Historic Site. Mission Tejas State Park, at the north end of Davy Crockett National Forest, is marked by a predominance of loblolly pines. The Rice Family Log Home, a stopover for many travelers in the 1800s, represents the quintessential “dog-trot” log home of pioneers. Today, a newly constructed three-building interpretive center with timber siding and pine-needle-textured footpaths will include an exhibit hall with artifacts, photographs and artwork, along with interactive exhibits. There’s an El Camino Real hiking segment in the park, too. Along the outer rim of the Hill Country (or, as the Spanish called it, Lomería Grande), at the base of the Balcones Escarpment, abundant springs gush from the ground in San Antonio, New Braunfels, San Marcos and Austin, an irresistibly cool offering for parched travelers. These rest stops, or parajes, later bloomed into settlements. In 1716, Domingo Ramón’s expedition brought the first full-scale colonizing venture into Spanish Texas. Women and children came, along with a thousand head of goats, sheep and cattle, scores of oxen with two-wheeled carts and 4,000 horses and pack mules. After passing San Pedro Creek near present-day San Antonio, the caravan skirted the Hill Country past the Guadalupe River and crossed the San Marcos River. Later, they followed the west bank of the swift-flowing Arroyo de las Garrapatas (named after the ticks that plagued travelers), until they could cross it on a ribbon of stones that provided solid footing across the swollen creek. Today, that creek has been identified as Onion Creek, and that crossing is at the Upper and Lower Falls of McKinney Falls State Park in Austin. 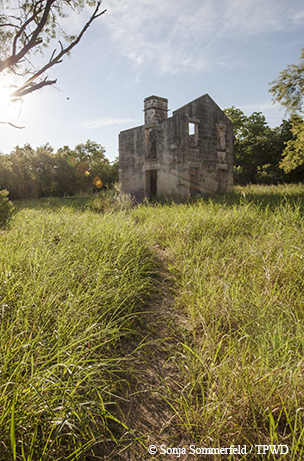 The sounds made by those traveling parties — hammering hooves, bleating goats, clanking bells and groaning wheels — can be imagined at the Lower Falls, where spidery arteries of worn wheel-ruts stretch across the wide swaths of limestone, and soil swales run on the opposite bank up to the old ruins of the McKinney homestead. Thomas McKinney built his homestead in 1850 near the spot where El Camino Real crossed Onion Creek in what is now McKinney Falls State Park in Austin. A half-dozen expeditions crossed the falls in the 18th century. Throughout the second half of the 19th century, the McKinney homestead served as an informal meeting place at the crossing, with one of the first gristmills in the area. Thomas McKinney recognized the value of land at El Camino Real crossings and purchased the land in 1850. Today, visitors can travel the Homestead Trail to see the homestead and gristmill remains and walk the Rock Shelter Interpretive Trail to learn about the Native American presence in the area. They can swim the same cypress-lined emerald waters or stargaze under the same skies the Spanish used for navigation. Renovations this year to the park’s Smith Visitor Center, damaged by floodwaters, will include El Camino Real interpretive exhibits. Marqués de San Miguel de Aguayo, a later successor to de León as Coahuila and Texas governor, returned to Texas in 1722 to establish a mission along Matagorda Bay (they called the bay La Bahía del Espíritu Santo, or Bay of the Holy Spirit). The mission was called Mission Nuestra Señora del Espíritu Santo de Zúñiga, and its companion presidio was the Presidio de Nuestra Señora de Loreto de la Bahía. In 1749, the mission moved to its present-day location in Goliad. Branded as Texas’ first great cattle ranch, the mission raised 40,000 head of cattle in its heyday. In 1768, the mission grounds held livestock and grew crops — a tempting bounty for local tribes during periods of scarcity. Paired with its companion presidio, La Bahía, a quarter-mile to the south, the complex administered a 1.5 million-acre area, nearly the size of Delaware. Any additional supplies the mission population needed were acquired through trade with San Antonio. La Bahía became one of the most important forts on the Spanish frontier and along El Camino Real. “Goliad was a destination, a big deal,” says TPWD interpreter Ray. 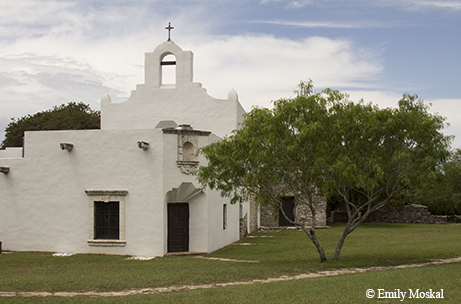 Mission Espíritu Santo in Goliad State Park was reconstructed by the Civilian Conservation Corps in the 1930s, its white plaster walls standing out amind the South Texas plains. But by the 1830s, the mission had declined; by the 1900s, all that remained of the mission was the foundation of the walls outlined on the land. 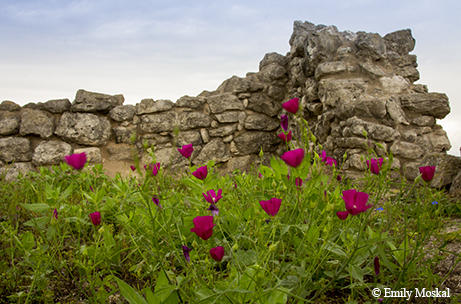 In the 1930s, the Civilian Conservation Corps rebuilt the mission walls from the ground up, using the ruins as a blueprint. The walls were built so that on one day in mid-April, visitors can witness an illumination event. On only that day, a sunbeam shines through a small circular window above the choir loft and illuminates the altar crucifix. Today, at this and other TPWD parks, interpreters help bring culture and history to life. Volunteer interpreter Ernest Barnes demonstrates the weaving methods Native Americans used to make blankets, a valuable trade item. Spanish cattle still thrive on Texas ranches, as does the Tejano and vaquero culture. Presidio La Bahía, Zaragoza Birthplace State Historic Site and the ruins of Mission Rosario are just down the road. Presidio La Bahía was one of the most disputed sites on Texas soil, with every attempt to change the order of government in colonial Texas involving a capture of the fort, as evidenced by the nine flags whipping in the wind at the entrance. Goliad State Park’s custodian house, built in 1937 by the CCC, will serve as a new visitors center for El Camino Real de los Tejas National Historic Trail. Mission Rosario may be visited only by appointment, but new interpretive panels are open to the public outside the gate. After the East Texas missions failed, a royal order was issued in 1772 to abandon all missions and presidios except those at Goliad and San Antonio. Some missions were ultimately moved to and remain in San Antonio, the center and capital of the province for many years. To colonize the town, Aguayo suggested that families from the Canary Islands be moved to San Antonio in 1731. The 56 immigrants formed the nucleus of San Fernando de Béxar, the first regularly organized civil government in Texas. The villa layout began as the Plaza de las Islas (Main Plaza) and the Plaza de Armas (Military Plaza) to the east. The presidio captain named them hijos dalgos, persons of nobility. The oldest families in the city can still trace their lineage to these original settlers. San Antonio became the major crossroads of El Camino Real, the gateway to the other three major destinations of Laredo, Goliad and Nacogdoches. Road signs mark the route of El Camino Real between Austin and San Antonio. The trail features have remained in use here for three centuries. The layout of downtown San Antonio still matches old Spanish blueprints. The 1720s Military Plaza at Spanish Governor’s Palace still faces City Hall, the modern seat of government, and at the center of the Main Plaza stands San Fernando Cathedral. Today, tourists saddle up on Segways as they pause briefly in front of the cathedral’s facade, and people dine at the still-bustling activity center of the city. San Antonio became one of most fought-over cities in North American history during the Texas Revolution, and the Goliad-to-San Antonio segment of El Camino Real was key to defense. The Goliad Massacre and the Battle of the Alamo provided impetus for the final victory over the Mexican army at San Jacinto, where the battle cry, “Remember the Alamo! Remember Goliad!” was coined. Civilians fled east on the trail during the Runaway Scrape, and Sam Houston traveled part of the trail to the Battle of San Jacinto in 1836. Today, in San Antonio, the 8-mile Mission Trail follows some of the original El Camino Real route and connects five missions in San Antonio Missions National Historical Park. The Mission San Francisco de la Espada is the legacy of the burned 1690 San Francisco de los Tejas from East Texas. What became Mission Concepción and Mission San José were moved to Austin from East Texas before ultimately ending up in San Antonio. Together with other missions they represent the largest concentration of Spanish colonial missions in North America and were named a UNESCO World Heritage Site in 2015, the first such designation in Texas. The Old San Antonio Road segment of El Camino Real de los Tejas can be roughly followed along Interstate 35 between San Antonio and Austin. Along Texas Highway 21 from San Marcos to Nacogdoches, many granite markers tip a hat to the trail’s history and contributions to the colorful state we know today. Significance: Onion Creek crossing, swales and limestone wagon tracks, McKinney family homestead. Project: The flood-damaged Smith Visitor Center, which has been closed since the 2013 Onion Creek flood, will be renovated to protect it from future flooding and will feature new media exhibits and interactive elements on El Camino Real’s influence on Texas settlement and continuing Spanish influences in Texas. Significance: Original segment of trail and swales, a log building commemorating Mission San Francisco de los Tejas, Rice Family Log Home. Project: A three-structure interpretive center will include an exhibit hall and gift shop. The new exhibit hall will feature artifacts, photographs and illustrations, along with interactive, touchable exhibits. The building will feature wood similar to that of the Rice Family Log Home, plus pine-needle-textured paths. Significance: Mission of Nuestra Señora del Espíritu Santo de Zuñiga, Mission Rosario. Project: The custodian’s cottage — built in 1937 by the CCC — will be adapted to serve as a new visitors center for El Camino Real de los Tejas National Historic Trail. Mission Rosario can be visited only by appointment, but new interpretive panels are open to the public outside the gate.